As the years roll by, pigeons are becoming an increasingly more annoying problem all over the world. This is especially true in cities and towns, in any location with a high circulation of pedestrians. That’s because these pesky little birds have found a way to coexist with us and have even prospered from humanity, and our garbage. Known as rats with wings, they have become a kind of parasite on society many people are looking for ways to control pigeons and remove them from their property for good. 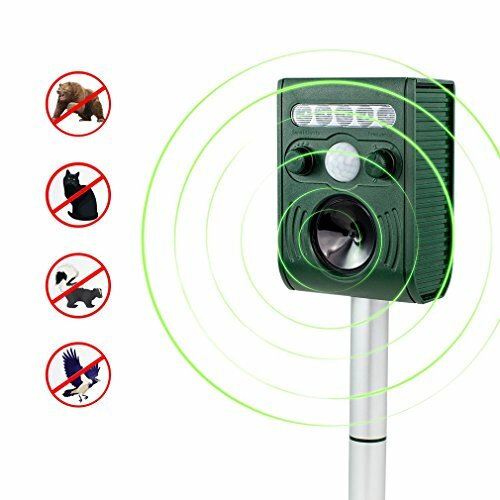 After reviewing many different products, we have settled on the four pigeon repellents/deterrents which we believe would be the best solutions to your problems. Before starting with the reviews, let’s talk a bit about the pigeons themselves and the problems they tend to cause as you are probably not familiar with all the problems they can cause and what hugely problematic pests they actually are. 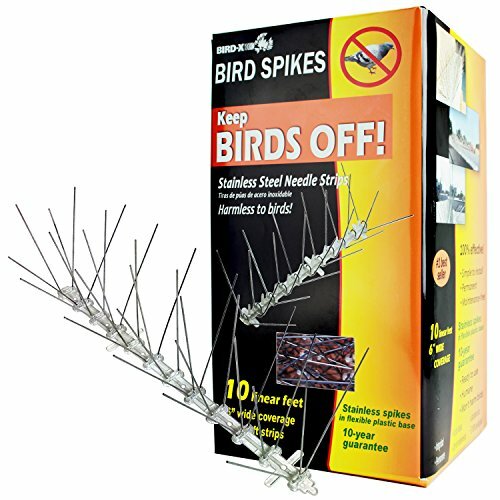 Cruel to some, ideal to others, the Bird-X Spikes Kit is still an effective method for deterring pigeons and other types of birds. If you believe that this is cruel, let us convince you otherwise. First of all, you should be aware of the fact that birds won’t actually land on these spikes, as they are not that stupid (even though they appear very dumb at times). Second, the product is a deterrent, not a defensive mechanism of sorts. It simply deters pigeons from approaching and they never actually touch it. And third—and most importantly—it’s completely harmless to birds. The spikes are not sharp at all; they can barely pop a balloon and much less harm a whole living thing. With all that in mind, you can now be certain that this product is not inhumane we should mention that this deterrent comes in several versions, each covering more or less area. The cheapest version, and the smallest one, of 10 feet is less than two dozen dollars. The Bird-X spikes kit is made from stainless steel so you can be certain that it will last for a very long time and remain very effective. Furthermore, it means that this is a permanent solution for your pigeon problems as you also won’t have to take care of it at all. It’s truly the best pigeon deterrent in its category. Furthermore, the kit is very flexible. You won’t have any problems when mounting it wherever you want it to be. The base is not fixed which makes the product easy to set on curves and other uneven places. You can easily put it in place with a few screws or with simple tie-downs—whichever method suits you. 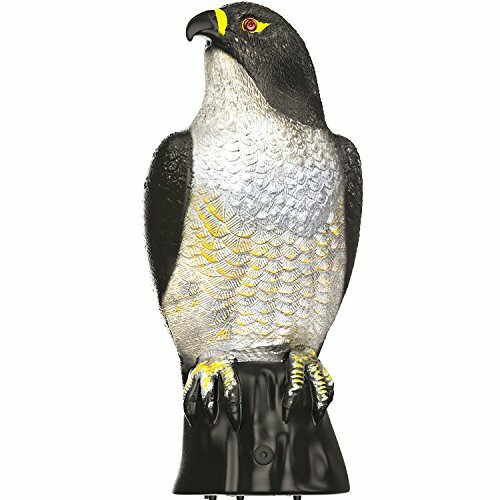 The realistic looking Eliminator is a model of the pigeon’s natural predator: the Eagle. This makes the product the best pigeon deterrent of its type. The eagle acts as a decoy as it is realistic enough and made in natural dimensions that it easily fools all the animals that are the usual prey to the mighty bird. This means that you can use it as a deterrent for many other types of pests like mice, rabbits, other types of birds, and much more. The Eliminator Scarecrow is inexpensive and you can buy it here. Once you buy one, you’ll see just how easy it is to use and how effective it actually is. First of all, the product can be placed almost anywhere and there are no steps of assembling it once you buy it. It comes ready to use and only needs to be put on something and turned on if you want to use its additional options. Yes, it’s quite neat. It can produce sound and have flashing eyes for the ultimate scare tactic against pests. These options are just that: optional. Therefore, you don’t have to use them if you don’t want to. Also, the energy for them is produced from the sun since the product is solar powered. In addition, the deterrent is also weatherproof, so no water or terrible weather will cause it problems. In other words, it will last and work properly for a very long time, making it a perfect solution for your pigeon problems. 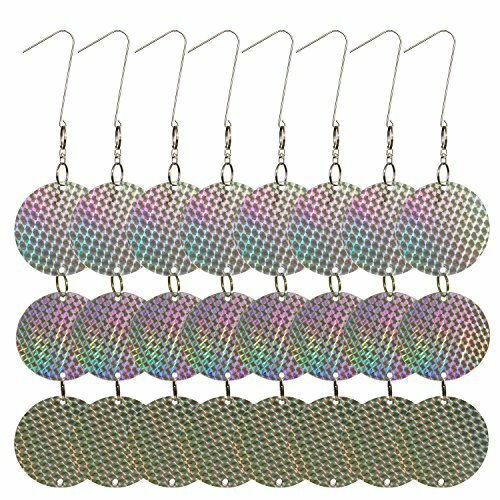 Just like any other shiny, patterned deterrent, Bird Repellent Deterrent Discs work by the same principle. The principle that birds—pigeons included—hate anything shiny as it distracts them while flying. Which is why this product is the best pigeon deterrent of its type. But why is that you may ask? Why is it so different and better from the other ones of its type? The answer to this question lies in many different factors. The price is not big and you can buy them here if you already decided that they are your solution. If not, read on—you’ll soon be convinced. The most important thing about them is that they can be used as an effective deterrent and as a decoration. Many types of deterrents are usually quite ugly and the fact that you need to look at them all the time is not really appreciated. That’s why this product is the perfect solution for this common problem. You can put them separately all over the place and protect your property from the pesky pigeons all the while creating a pleasant atmosphere and some nice additions to the overall décor of your garden or yard. The quality discs shine brightly in all directions to ensure the nuisance birds to avoid the entirety of your land. Also, an important thing to note is the fact that this is a perfectly humane method of solving your pigeon problem. The Aspectek machine repellent/deterrent uses high frequencies to deter a lot of different animals, making the product a great solution for many people. Since you are here because of the pigeons, you’ll be pleased to know that this product works on all sorts of birds—including pigeons. This perfect product is very easy to use as well. Once you buy it, you just need to take it out of the box, set it up, and place it pointing to the direction where the pigeons are flocking. Before it gets to work, you’ll need to set it up. It does come almost ready to use, but you do need to assemble the simple metal spike that acts as the leg of the machine and put in the ground. Then you are only left with putting the machine on the stake and adjusting it to the proper frequency for birds. After that’s finished, you’re set. The machine will work all the time in any type of weather. You don’t need to worry that it will break from bad conditions or anything like that. Besides, it’s also perfectly humane as these frequencies only bother animals, making them want to leave the area, without harming them in any way. If you have now decided that the product is perfect for you, you should know that it is inexpensive. The most important thing to note is that the pigeon is an incredibly widespread species that exists almost everywhere on the planet and they are most abundant where there are a lot of people living. Over the centuries, we have domesticated many pigeons and others just started coexisting with us. Long ago, pigeons were incredibly useful, but today they don’t really have many uses for us. Most of us just end up tolerating them. However, they do have a part to play in the overall ecosystem, just like any other living being, but due to their nature and the fact that they live very close to us, you can’t but have plenty of problems with them from time to time. On the other hand, they are usually a welcome sight in most squares around the world and people usually like having them there as they add something beautiful to the overall look of the city center. If not pigeons, then doves certainly are a welcome sight. Conversely, the last thing most of us want is to see hundreds of pigeons roosting on the ledges our property, as they can cause a whole host of problems. First and foremost are the hideous droppings these nuisance birds leave everywhere… on the window ledges, the balcony, the roof, and chimney, the floor, all over your car… pretty much anywhere below where they roost. Outside of your home, you don’t need to worry about it too much, except for the rare occasion when one manages to relieve itself right on your shoulder or, worse still, right on your head! But when they start flocking to your garden, for example, that’s when the droppings directly affect you. Nobody wants to clean after them. Most of us hate having to take care of our own pet’s poop, much less the ones left by the countless birds that you didn’t even want at your home in the first place. Also, if left, pigeon poop can actually damage the paintwork on your car. They can damage your property as well, which ends up costing you time and money to repair. This happens for a variety of reasons but, most importantly, it can turn out to be very dangerous when they build nests on top of your chimneys or inside your vents, which creates a potential fire hazard. Their nests are usually quite flimsy, made from sticks and other easily flammable debris, so it’s very easy for them to catch fire, especially if they are on top of chimneys. Ultimately, pigeons are also dangerous and a problem because of the numerous avian-borne diseases they can carry, many of which affect humans. They are also hosts to a lot of other pests like ticks, mites, fleas, and more, which also affect you and your pets. For all of these reasons and the fact that they are incredibly loud and annoying, you need to get rid of them. As most DIY methods or hiring professionals is a very time-consuming and expensive ordeal, the products we have reviewed offer the perfect solution. With that in mind, let’s take a look at the products we have carefully selected ways to control pigeons at home and keep them at bay. We have found the best pigeon deterrents on the market for you to use and get rid of your constant pest pigeon problem. As there are plenty of different products out there, with many of them being very effective, our review several from each different category should help you make an informed choice.